But the other way around? As I swam through my childhood memories in Mexico City I was startled by how wrong my natural response had been. Of course there are Mexicanized American foods, and plenty! Where to start? 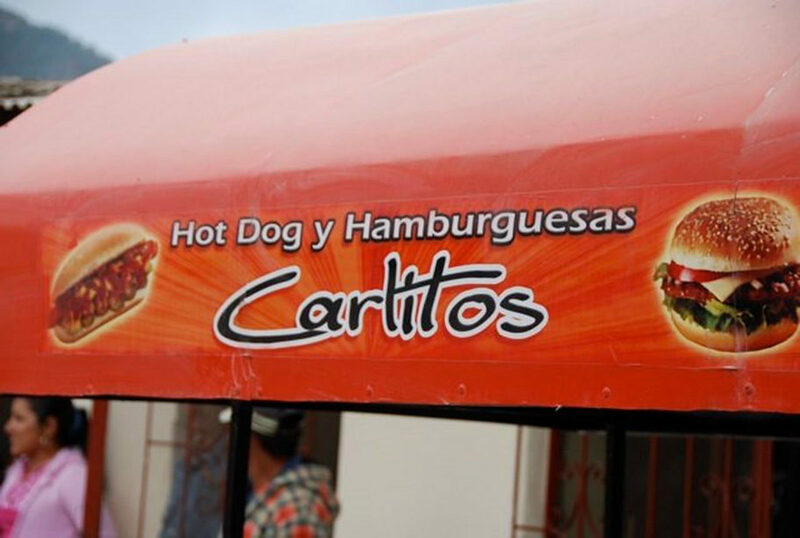 How about those incredible hot dogs my three older sisters and I used to eat at El Galan (translates to the hunk) hot dog stand. We got into so much trouble with my father because of them. As soon as my oldest sister could drive, we stopped on our way back from school to eat one, and why not two, and why not three hot dogs con todo, with all the trimmings. We were so full by the time we sat down in front of those homemade meals my mother had planned for us, that we could barely fit a bite into our mouths. My father angrily gave us a weekly hot dog allowance and asked my mother not to cook for a couple weeks. We would only eat them on Fridays. These hot dogs were soooo Mexican. El Galan, drizzled some oil on his hot plancha or griddle. He then threw in some chopped white onions, pickled jalapenos, and tomatoes. Then, as they sizzled, he would squirt some ketchup (with some secret ingredient we still can’t figure out) and yellow mustard and mix it all up. He threw a slice of cheddar to crown that delicious mess, he let it melt, and then shoved it into a soft hot dog bun. A steaming hot sausage then sat on top. If that wasn’t enough, if you said you wanted your hot dog especial, or special, a couple of crispy bacon slices found their way into that party. Right now, I would give up all that is in my refrigerator to have one of those. I had the same thing at a stand in tulsa Oklahoma best Mexican hot dog I ever had!!!!! Sorry I missed your visit in San Antonio- I would’ve gone for sure if I knew! Oh here are some of my chayote recipes: https://patijinich.com/recipe/chayote-squash-and-pickled-onion-salad/ https://patijinich.com/recipe/chayote-apple-and-jicama-salad-with-avocado-and-pepita-dressing/ https://patijinich.com/recipe/coloradito-chicken-recipe/ https://patijinich.com/recipe/mole-de-olla-2/ Enjoy, Lisa! Last night I watched your show on PBS. You made a dessert the resembled flan, but wasn’t flan. Can you give me the proper name and recipe? Kincaya or kincalla or something like that? hello pati just saw your show for the first time and i loved it,you were cooking with your handsome boys. i specially loved juju. you made them this delicioso alphabet soup and what i want is your receta for the cheesecake you made for dessert you used marias cookies and had cajeta too for the top i really want your receta please and keep cooking you are so pleasent to wach . We are very careful of our personal e=mail. Thank you for your cooperation. I’ve gone to Hotdogs “El Galan” by the University in Mexico City. They are the BEST!!!! you cannot eat only one!! they are AMAZING!! OMG! I would give up anything to eat one right now too!! Si Paty! de hecho esta Navidad pasada fuimos pero estaba cerrado. 🙁 y nos moriamos de ganas. Fuimos a otros y tambien cerrados. Creo que cierran cuando la universidad esta de vacaciones. Si yo tambien mejor publica la receta mas cercana o que se le asimile a esos hot dogs de “el galan” . Saludos!!! P.S. y que me dices del farolito? por ahi vi una foto que parecia que era ahi….oye y donde tomaron ese tren? LOL Thank you for posting this! My husband thinks I’m a nut because I put so much stuff on my hot dogs (he’s the plain mustard guy. )I like my hot dogs LA style, wrapped in bacon, melted cheese, tomates, chiles vinagres, and cebolla. I even throw in some aguacates! Que delicia Pati!! I’ll like to check if my almost 39-year stomach is still up to the test!! I’ll let you know if I gather enough courage to try one of those after so many years! Cada dÃ­a disfruto mÃ¡s tu blog! Un abrazo. Gracias por compartirnos todo esto! !